The idea of traveling the world without a care or a worry seems like a dream come true. Unfortunately, it’s not realistic for the vast majority of the world’s population when you consider the expense of travel.When a "staycation" just won’t do, it’s time to book a real getaway. But whether you're traveling solo, with the family or taking a romantic trip for two, money is always an important thing to consider during the trip-planning process.However, simply because travel isn’t necessarily cheap doesn’t mean you can’t do it. Travel pros know there are a few ways you can save big when you book your next vacation. 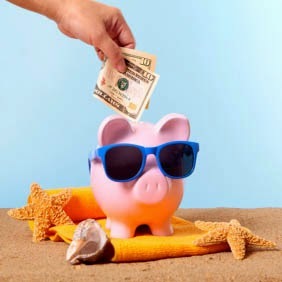 Cleaning out your savings isn’t necessary when booking a vacation. Here are some most useful tips to cut your costs. Whether it's regarding the dates you're traveling or the cities you’re going to, flexibility is a great way to take advantage of the best travel deals available. Let the deal be your inspiration. You're going to get a lot more mileage out of your dollar if you're flexible,Say you want to go to Hawaii, but there's a great deal to Mexico or the Caribbean. The flight is half the time and probably half the cost; you'll still get that beach destination, but you'll save time and money. If you can be flexible, you'll get a lot more for your buck. When you book your hotel packaged with your airfare, you're gaining access to deals that aren't available to the general public.Hotels will have a rate they aren't publishing publicly, and airlines will have a fare they aren't making available to the general public, so agencies will combine the two to come up with a really hot deal.All-inclusive hotel packages can also be a great way to control your expenses. You're not pulling out your wallet all the time for meals, drinks, entertainment, activities…it's all included,Plus, some resorts even have offers where kids stay and play for free. And most of them have kids clubs, where the adults can be by the pool while the kids are having fun at the jungle gym with their buddies. Why are you packing shampoo, conditioner, soap, and toothpaste? Those items are readily available at most hotels for free. In fact, there are many hotel freebies that are ripe for the taking. The benefit of leaving the toiletries at home is two-fold: Not only will it preserve your own private stash, extending the life of each, but it also will reduce, albeit minimally, the weight of your bag when packing for vacation. With rising airline baggage fees, every little bit counts. Popular apps like Foursquare and Scoutmob can help you locate one-off discounts, but how do you find establishments that offer regular deals? There are lots of lesser-known, free apps that can save you big money over the course of your trip. One of my favorites is Happy Hour Finder, which lists all the happy hours in the immediate area, what the deals are, and what day of the week those deals are available. This is an excellent way to find discount booze, as well as occasional free meals, without having to travel too far. Think you can’t get from the airport to your accommodations on public transportation? Think again. In New York City, for example, you can get from all three local airports to wherever you’re going in the city by bus or train. Even in a smaller city, like my hometown of Baltimore, there’s a light rail system that connects from the airport to many points through downtown and the suburbs. If the public transportation doesn’t drop you off on the doorstep, at least it will get you closer so you can cut the cost of taking a cab. If you have to drive (or want to), don’t forget to pack your own GPS navigation device in your carry-on or checked luggage. The car rental agency will try to up-sell you on a GPS rental, but that’s money that you can save to spend elsewhere. Whether it's a matter of extra amenities or ample room size, certain hotels are much more family-friendly than others. You should search for the one that has the most perks to suit your interests and needs. Embassy Suites have a great complimentary breakfast every morning and an evening wine reception for grownups and the rooms are conducive to traveling with families. They're more affordable and you get a lot more space, which makes traveling with kids more bearable.Some hotel chains have extra services for kids. Loews Hotels, for instance, have everything you might forget, from games and Silly Putty to nightlights and training potties.Fee-free perks can help you save money in the long run, so always consider what's being offered to guests before you book a room. You may already receive emails from sites like Groupon or LivingSocial that offer deals based on where you live, but you can also get top deals for the cities you're planning on visiting, as well. Sign up a couple of weeks before you go so you can get coupons for dining and local attractions.and for families, there's Mamapedia, which has family-oriented and kids deals, or two-for-one deals. It doesn’t just have to be for the city where you live. Travel is great, and it’s possible to do it on a budget if you know how. It might take a bit more time and effort to save significantly, but it’s worth it in the end.